Ordinary folk in Shakespeare’s time were familiar with the medicinal use of plants. In this speech from Hamlet, Ophelia is playing to the cheap seats when she mentions some constituents of a typical garden of the times, in which flowers, herbs and vegetables were common bedfellows. A study of herbs is also a study of language. It takes us back to a time when European parlance was a mushy mix, before the colonization of the New World called a new kind of “English” into being. Shakespeare’s audience, from the nobility down to the hawkers and the hoi polloi, would have recognized the pun on “pansies” and “thoughts.” “Pansies” were “pensées,” or “thoughts,” in French, a language much enmeshed with the English language of Elizabethan times. Pansies were also called “heartsease” and were reputed to cure romantic ills. In Ophelia’s case, they were too little and too late. Daisy, to the Renaissance audience, wasn’t just a pretty face. Even this common flower was a medicine, its potency indicated by its original name, “day’s eye” (you can reference Chaucer for that). The flowers when boiled made an infusion well known as a remedy for wounds and fevers. Daisy was also called bruisewort or brainwort, and Shakespeare’s mention of it would have been a broad hint about Ophelia’s mental state and impending suicide. Elizabethan play-goers would also have known that rue, with its bitter taste, symbolized regret, and that it could be used as an abortifacient. This reference probably evoked snickers in the peanut gallery; the obvious implication was that Ophelia had been having it off with the Prince and a Princelet was on the way. Ophelia tells her mother Gertrude that she must wear her rue “with a difference,” a reference to the queen being past her child-bearing years, and regretful, perhaps, of her incestuous alliance with her dead husband’s brother. That zany Will—he never missed a chance for a multi-purpose pun. Rue, called the “herb of grace” because sprigs of it were used for sprinkling holy water, is of the same family as poison oak and can be toxic in large doses. Columbine seed was also said to hasten labor, an insinuation that would not have been lost on Will’s fans. Fennel was a general cure-all and wild, or hog’s fennel, was prescribed for dizziness and headaches, an appropriate anodyne to the sorry state into which Ophelia is sinking. The Bard’s audience would have connected all the dots when Ophelia floated up the river drowned under the weight of her garments, possibly after trying to abort her unwanted royal offspring by overdosing on rue, an action she would have had cause to regret at the last. Her garland of violets was a last sad symbol of (lost) virginity. And doubtless rosemary would have fulfilled its traditional role at Ophelia’s funeral, tucked into the coffin to mask the odor of decay. If all this speculation seems a bit overblown, remember that plays and pageants, as well as gardening, were entertainment and education for people who didn’t have the stimulation of high-def TV and computer games. Whoever you think Shakespeare was, you would probably agree that he was well-read. Culpeper’s Herbal, a definitive work on the propagation and medicinal uses of plants, hit the stands just ten years before the first performance of Hamlet. Nicolas Culpeper’s ground-breaking (pardon the pun) work on herbs is still used as a reference in our times. With so little reading matter available, who can doubt that Will had read Culpeper? Monastery or convent gardens in Shakespeare’s time were called hortus conclusus, or enclaves and were often known as “physicks” for their curative elements, whereas the castles were likely to have a pleasaunce (note the Francophone influence) a utilitarian garden that incorporated statues, bathing pools, labyrinths and complex knot gardens woven of fast-growing hedge. Home gardens combined the best of both, with an emphasis on variety. To the pre-modern horticulturalist, the fragrance of the garden was as important as its appearance was as important as its usefulness. Imbibing fragrance was reckoned to be healing in itself, an experience we moderns mimic, rather pitifully, employing electric odor-spritzers to bring pleasance into our stacked and crowded enclaves. Thus began a segregation of herbs into their own little spaces, the relegation of food plants to a less visible area of the newly conceived “lawn” and the aggregation of flowers purely for color’s sake. Then came the Age of Reason, when scientific and philosophical templates were imposed on all aspects of human life, including the garden. Institutional husbandry was born. The garden became a series of organized “boxes,” departing from the pre-modern notion of the garden as a mélange of art-form, pharmacy, and retreat. While we’re back to semantics, consider this: culture and cultivation refer not just to the soil but to our selves. We dig into our own lode of acquired knowledge and intuited understanding to make ourselves “cultured” people. We “cultivate” good acquaintances and shun bad company to make ourselves more fragrant/attractive, like well tended blooms. Where we are deficient or infirm, we look for the right toppings of chemicals or go organic and try to heal ourselves from within. We offer healing to others. We are gardens. This is the secret good gardeners have always understood innately. The other secret is that while one needs a degree to be an agriculturalist, anyone may become a horticulturalist. It takes less land and it’s equally enriching. A Shakespearian garden can be encompassed in a quarter acre or less. Medieval/renaissance gardening presupposed an integrated approach and relied on organic methods. In pre-modern gardening there was no plant without a purpose. Humble comfrey and stinging nettles offered new life to their leafy brethren when chopped and added to compost. A medieval rose would look, to our modern eyeballs, petite et sauvage. But it was prized for its rarity and its fragrance, and tended accordingly. Old apples, as modern growers know when they take on the rewarding effort to produce “heritage” stock, were small and gnarly. But the flavor! Priceless. So let us take a walk around a home garden of the 1550’s, the hey-day of Will Shakespeare’s turn on the stage. We’ll imagine it’s a rare day in June in southern England, the shire-land so beloved of J.R.R. Tolkien. Not too hot, but moist, green, and bright. The garden would be near the house which in turn would be enclosed in a fortress of sticks or stones accommodating an extended family and dotted with buildings for various homesteading activities. These were not optional but life-supporting—the making of pots, the slaughtering of beasts, the drying of herbs, the forging of weapons for hunting and protection, the aging of cheese, the dyeing, spinning and weaving of cloth and so on. Within this fenced or walled mini-township would be the secondary walls of the multi-purpose garden/orchard/pharmacy/meditation area. “..First, the skilful and wary Husbandmen in time past, being those of good abilty, built them walls about of Free-stone artly laid, and mortered together, and some did with baked bricke like handled. Others of lesser ability, and of meaner sort, formed them inclosures, with stones handsomely laid one upon another with morter or clay; and some of them couched the broad salt sontesk, with other bigge and large stones (in like order about).” (Thomas Hill, c. 1545). As we open the wooden gate, we see a simple pattern unfold before us: raised beds, radiating out in four sections, marking the compass points and symbolizing the four seasons. (The most common model was square or rectangular but circular forms were not unknown). The centerpiece is a small fountain, not the bathing pool found in the luxurious Shakespearian gardens of the highborn, but a practical spring for watering plants. Still, despite its humble purpose, it is designed so that water passes through a bowl held by a stone cherub. The sight delights the eye and the sound adds to the sense of tranquility. Though raised beds are often touted nowadays as the height of good horticulture, they were originally developed for mere custodial convenience. Why bend over more than necessary? The width of the beds was measured for compatibility with gardener’s arm’s reach for planting and weeding, while the length was deemed unimportant. The paths between beds, of bricks, stone, or sand, were also for the gardener’s convenience, with the coincidental result that our pre-modern ancestors could stroll through the garden and easily see and appreciate everything in it. Beyond this quadrangle, on the far wall opposite the gate, is a row of fruit trees beneath which is a “flowery dell,” or small meadow. The trees are meant to remind us of Eden. Behind them may be seen treillage or espalier, more French for which no translation should be necessary. The espalier system allows vines or trees to be trained to spread on horizontal wires or poles; the fruit can then be plucked at shoulder height or lower (espalda = shoulder). Vines, both grapes and fragrant flowers, are espaliered or trained to drape over a trellis or pergola. Another combination of practicality and beauty. The fruit trees and “meadow” invite bees. Pre-modernists believed that bees were like unto human beings: their society was orderly, they knew their place, they worked without complaint Human beings spoke softly and trod lightly around bees, not only to keep from gettin’ stung but also to please the bees and provoke the production of honey. The buzzing of bees, a sound equated with intelligence, organization, and even saintliness, would add to the pleasant whisper of the pre-modern garden. We settle for a spell on a turf bench (planks laid across sturdy squares of flowering sod). The sheer variety of plants around us is food for contemplation. To give a flavor of the way our Shakespearian gardeners mixed and matched, we find rosemary among the herbs for stews, and again as a flower, and again as a hedge. Lavender also crossed many paths, being valued as an aromatic, a medicine and a hedge as well as a flavorant. Violets, considered by the Celts to be the heralds of spring, were part of the meadow-plot, could also be made into candy or wine, and contrariwise, as a tea to cure hangovers. Basil was said to both make scorpions grow—just put some under a pot for three days and, lo and behold!—and, paradoxically, to soothe wounds of scorpion bite. Could this be homeopathy at work? Cabbage was a remedy for tummy ache, and onions were thought to repel hostile dogs and cure “sudden dumbness.” Scorpions seem to have been something of an obsession, as even the common radish was reputed to repel them. Bay leaf protected people from the devices of Satan, while Angelica Archangelica, used to make sweets, was perhaps the most powerful nostrum against witchcraft (hence its potent name). Many plants were hopefully listed as contraindicative to The Plague, a misguided notion we moderns would have to contradict. 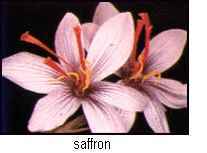 Saffron, a spice and a powerful ochre dye, could be used as an aphrodisiac and then to ease labor pains— thus connecting two important aspects of life. Aphrodisiacs were pretty common, it seems, with cloves, garlic, and radishes among the claimants. A pensée worth considering: why did our European ancestors need so many aphrodisiacs? And why do we? The overriding impression we get from our garden walk is that our great-great-great-greats lived within their environment, not separate from it. They were not burdened by a barrage of scientific claims and counter-claims, ads or infomercials. They tried in their own ways to connect what they saw, smelled and tasted with what happened in their bodies and minds. They postulated that “as the cause is, so must the cure be.” They took into consideration the motives of the heavens and the subterfuge of the devil as they mulled over what contributes to good mental and physical health. They appreciated the garden as a microcosm, created ways to enjoy it for its own sake, and meditated upon its eternal qualities while imbibing its odors and colors.